DoubleGuard® enables the 60T Stool Table to be stored folded flat for compact storage. These mobile tables store in less space! Meets and exceeds current UL anti-tipping safety standards. Safety is the first priority school furniture! Center Latches are accessible from either side of the 60T Stool Table. Saves time – less walking around tables. Two-stage latches have safety stop and in-use positions. Allows easier set-up positioning and clean-up. Door Clearance is not a problem; our 60T Stool Table easily clears standard 7’ door frames. 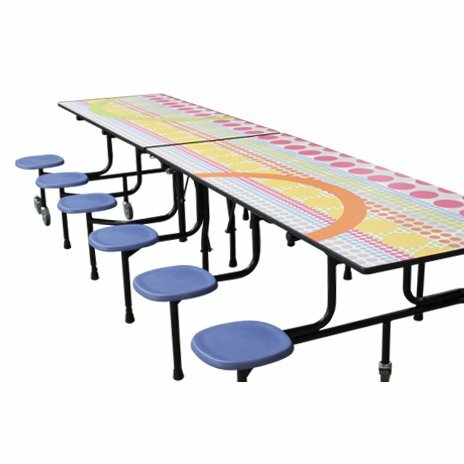 Cafeteria tables can be easily moved throughout your building.